The Cyber Shredder is a cybernetic engram of the Utrom ShredderCh’rell in Back to the Sewer. Though he is essentialy a copy of Ch’rell, he at first seems to be unwilling to work with his original self or the Tengu Shredder, as the three of them are eventually in combat. Though they did eventually join forces together to attack theTurtles and Splinter. In the episode “Wedding Bells and Bytes”, the Cyber Shredder returned. He had infected one of Splinter’s databytes, using it as a tracking beacon; when Donatello managed to reconstitute Splinter, the Cyber Shredder received the information to the process which allowed him to reduplicate the process on himself. Fully restored to material form, he, Khan and the Foot Clan attacked April and Casey’s wedding, but got destroyed by Don andSerling with the same decompiling blast which had destroyed Viral. The term Cyber Shredder was first used in Teenage Mutant Ninja Turtles III: Radical Rescue as a cyborg version of Shredder. This version of Cyber Shredder returned as a playable character in the SNES version ofTeenage Mutant Ninja Turtles: Tournament Fighters. 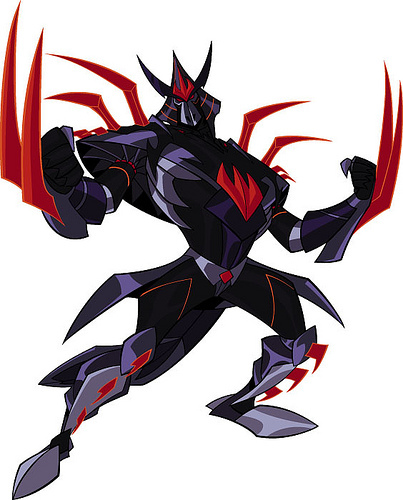 Cyber Shredder (the Viral version) is used as Shredder’s alternate costume in Teenage Mutant Ninja Turtles Smash-Up.